Accurate, timely, and transparent cost estimating is critical to the success of any renovation, repair, sustainability, or new construction project. While most construction cost estimators continue to rely primarily upon hardcopy documents and electronic spreadsheets, such as Microsoft Excel, many are beginning to leverage electronic cost books and associated calculator software tools. Both of these approaches have merit and are well suited for certain types of users. Growing numbers of cost estimators, however, need to work with multiple projects and multiple estimates simultaneously, securely share information on active projects, gain access to localized cost information, and easily locate and reuse historical data. These Owners, Contractors, and AEs are moving to advanced cost estimating and management systems. They are discovering that significantly higher productivity can be gained – as much as 50 percent or more. 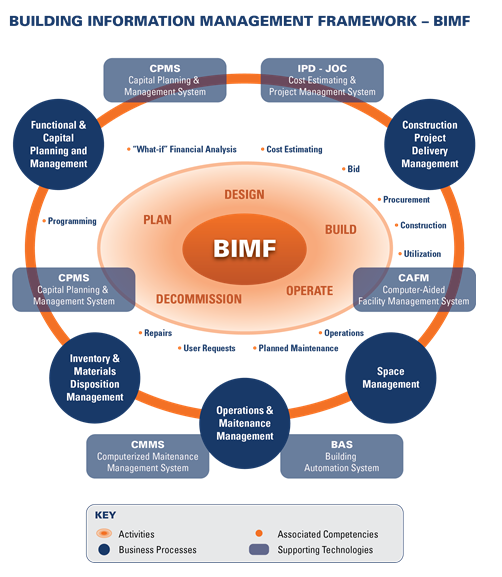 Furthermore, the collaborative aspects of these sophisticated software systems are aligned with integrated project delivery methods and construction sector movement toward Building Information Modeling (BIM). Cloud computing, a further advancement enabling even higher levels of collaboration and simplified deployment, are also now becoming available. 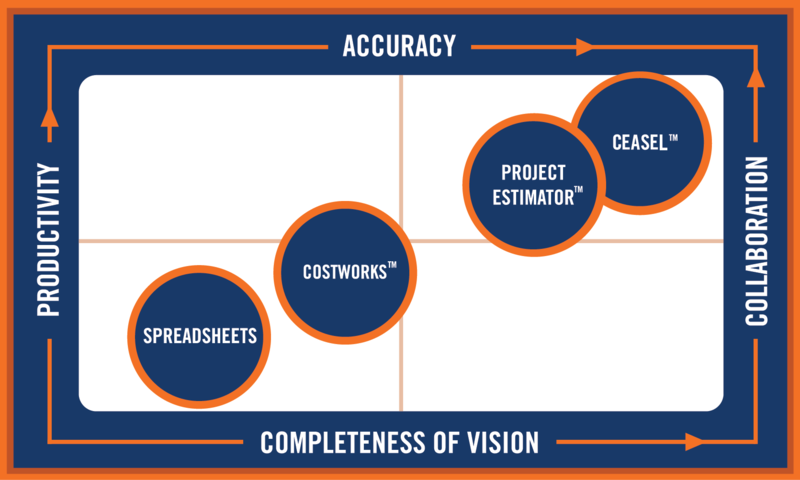 The image below portrays a graphical representation of the increase in accuracy, collaboration, productivity, and project completeness for various cost estimating methods. Construction estimating involves the estimating of material, labor, equipment, overhead, and contingencies. Spreadsheets, most commonly Microsoft Excel, are used by more estimators for this purpose than any other tool. Spreadsheets have significantly improved cost estimation capabilities and accuracy since the 1980s. Relatively easy to master, spreadsheets provide a means to create and report a construction cost estimate. Cost construction models can also be built within spreadsheets. Productivity improvements result from the ability of Excel to easily handle more of the mundane calculations required. Spreadsheets also do not account for dynamic cost information and associated uncertainties or historical information – all of which have proven to be important variables for many construction projects. Lastly, and in part due to the issues noted above, collaboration using spreadsheets is problematic, as are transparency and accurate monitoring and reporting. Having multiple people working on the same spreadsheet is not efficient or even workable for larger projects. Thus estimates tend to be created and stored in different locations, making information difficult to accurately retrieve and changes extremely costly to execute. As a result, old data errors are perpetuated, copied over and over again. As it became apparent that more localized and historical data would be critical to improving the accuracy of construction cost estimates and cost models, organizations instituted a formal process for collecting and storing this information. Individual Owners, Contractors, AEs, and other third parties began to collect this information. RSMeans Cost Data has become North America’s standard for commercial construction cost data including materials, equipment, and labor line items, productivity factors, and assembly and square foot cost information. Localized cost indexes, referred to as the City Cost Index (CCI), are also available. Based upon the size and type of construction project, estimators soon found that they could improve their productivity and accuracy even further by using standardized reference cost information in combination with spreadsheets. Such reference cost information included RSMeans Cost Data or other reference cost sources, along with cost data architectures such as Construction Specifications Institute (CSI) MasterFormat and UniFormat. However, manually entering in tens, hundreds, or even thousands of cost line items from hardcopy cost books remained tedious and prone to data input errors and errors of omission. Integration of electronic cost book information directly with a cost calculator was the next logical step. An example of this approach is RSMeans CostWorks product. CostWorks can best be described as an electronic version of RSMeans Cost Books where line items can easily be copied and pasted into spreadsheets. CostWorks also incorporates some limited cost calculation tools moving it even closer to the needs of construction cost estimators. Many inherent data input errors associated with spreadsheets appeared to be mitigated. Other issues remained largely unsolved including: collaboration, data reuse, document management, integration and maintenance of alternative cost data sources, reporting, and the integration of robust construction delivery workflows. To provide easier Internet access to RSMeans Cost Books, RSMeans Online is now being offered in addition to the CostWorks CD-ROM. RSMeans Online enables simplified deployment and a somewhat updated user interface. Spreadsheets have proven valuable for single, static estimates of a certain project size, as well as for a media to gather and transfer data sets. 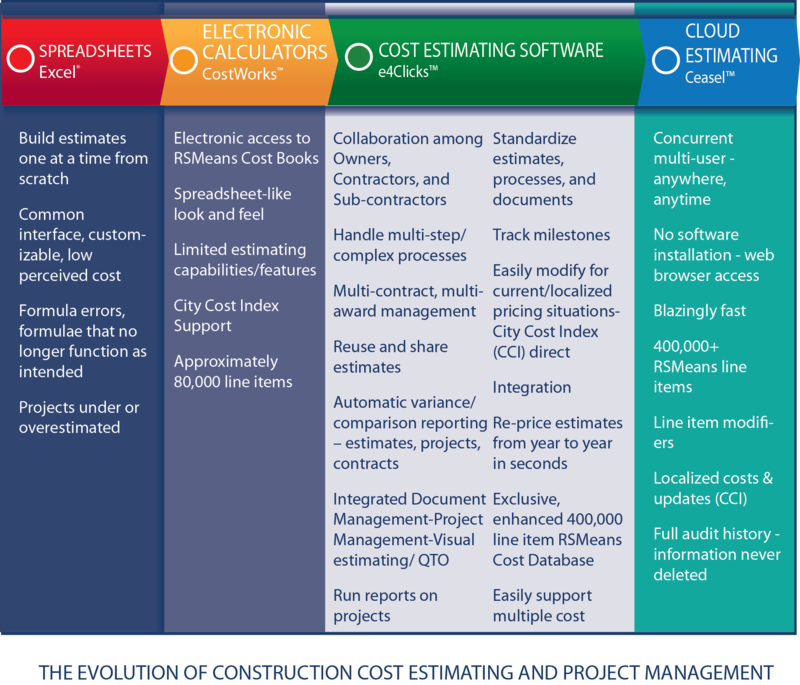 Similarly, the integration of electronic cost books with spreadsheets and electronic cost calculators (such as CostWorks/RSMeans Online) are equally valuable for individuals performing a small number of relatively straight forward construction, repair, or renovation estimates (three to five per year). However, both spreadsheets and electronic cost calculators do not meet the need for collaboration, transparency, document management, and maximized productivity. They also do not provide a capacity to adhere to and report upon specific construction delivery methods and/or contracts such as Job Order Contracting (JOC), Integrated Project Delivery (IPD), Simplified Acquisition of Base Engineering Requirements (SABER), and Indefinite Delivery Indefinite Quantity (IDIQ). Collaborative cost estimating and project management solutions also support today’s need for Adaptive Project Delivery (APD)ä. APD enables Owners, Contactors, and AEs to modify and constantly improve upon construction project delivery processes to meet their individual and changing requirements. Integrated cost estimating, project management, contract management, and document management software systems have become very popular over the past decade and are exemplified by e4Clicks Project Estimator. e4Clicks Project Estimator incorporates this type of cohesive management in a single application. e4Clicks Project Estimator allows users to create estimates and manage multiple types of projects and contract methods: JOC, SABER, IPD, Single Award Task Order Contracting (SATOC), Multiple Award Task Order Contract (MATOC), Multiple Award Construction Contract (MACC), Indefinite Delivery/Indefinite Quantity (IDIQ), Performance Oriented Construction Activities (POCA), and Basic Ordering Agreement (BOA). Users can select from enhanced RSMeans electronic cost data, including an exclusive 400,000 line item database with full descriptions and modifiers as well as graphics, diagrams, and specifications, and/or custom/internal cost information or other standard/custom unit price cost books. Visual estimating and quantity take-off (QTO) are also core components of this type of advanced software. eTakeoffä, included within e4Clicks Project Estimator, stands head and shoulders above other visual estimating solutions, enabling estimators to quickly and precisely visualize requirements and trace electronic drawings to determine quantities for line items within estimates. 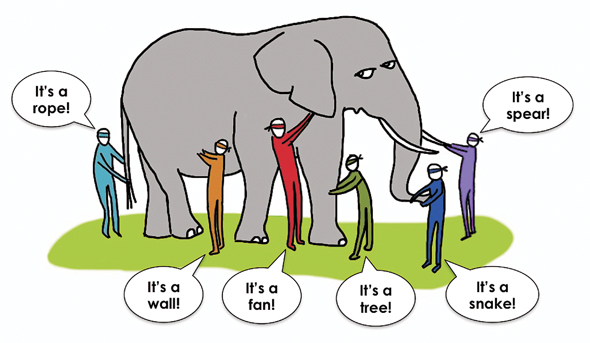 Drawings can be shared in various formats include Adobe Systems Portable Document Format (PDF). The eTakeoff/4Clicks integration enables users to quickly transfer to e4Clicks Project Estimator. Estimate and pre-bid processes without paper plans. Create measurements by tracing upon electronic drawings. View plans with powerful zooming and scrolling capabilities. Display measurements in an infinite variety of colors and patterns to identify the type of construction and the materials used. Total measurements from multiple plan sheets. Cloud computing enables the next level of collaboration and real-time work with virtually unlimited processing power and storage. Cloud computing applications, such as 4Clicks’ Ceasel, connect people, information, and processes – anytime, anywhere. Ceasel allows the user to do more with fewer resources, while also improving cost estimating and project delivery outcomes. This is made possible by Ceasel’s ability to enable higher levels of service, economies of scale through shared but secure resources, rapid and flexible deployment, standardization, and the ability for cost estimators, project managers, and procurement professionals to connect and share previously incompatible information. With Ceasel, the user logs in through a web browser and can immediately build estimates with the best representation of RSMeans Cost Data available, custom data, or a combination of both. Cloud computing technology stores data permanently, keeping a detailed history of changes so work is never lost. Unlike spreadsheets, Ceasel and similar products provide the flexibility for teams to work simultaneously with large databases from any location around the world. From a deployment perspective, cost estimating software solutions and true cloud cost estimating solutions address the creation of custom parameters, multiple “knowledge bases,” and easily support client-server network or stand-alone system environments. These powerful tools yield superior productivity, accuracy, transparency, collaboration, and information reuse. They are best suited for anyone using RSMeans Cost Data and/or custom cost data for renovation, repair, and sustainability projects, as well as estimators managing tens to hundreds of projects per year. The chart below shows the capabilities deployed by each estimating tool. Over the past forty years, there have been many initiatives to improve cost estimating to facilitate the delivery of construction projects on time and on budget. Owners, Contractors, and AEs now have multiple methods to select from based upon their needs. Spreadsheets were a major improvement in the 1980s, followed by formal processes for collecting and harnessing historical information to more accurately project and control costs. Over the past decade, a powerful new capability has been added, collaborative cost estimating and project management software. Within the past two to three years, cloud computing offers yet another advancement in terms of ease of deployment, scalability, and real-time collaboration. Christofferson, Jay. “Estimating with Microsoft Excel”, Brigham Young University. Nickols, Robert Duane. “Construction Estimating Using Excel” Lexington Technical Institute, University of Kentucky. 2 Caulkins, Jonathan P., et al. “Do Spreadsheet Errors Lead to Bad Decisions” Carnegie Mellon University. With a new year, comes a new round of 4Clicks training courses, and I have some new options this year. I want to share a quick overview of our upcoming classes. Our goal is to give you the tools and training necessary to navigate and make full use of e4Clicks. I hope you will enjoy the tweaks our team has made to better serve you. Keep an eye on our website for additional new classes as they become available. If you’ve enjoyed our other courses, you will benefit greatly from these estimating trainings in a traditional classroom environment designed to provide you with hands-on, real-life exercises. The first of these courses is Introduction to Architectural Estimating and will take place in February. Sign up today at www.4Clicks.com/training. I am excited to offer a virtual e4Clicks Getting Started training course. This is a 6 (six) hour online training course perfect for anyone who doesn’t have time to make it to one of our 2-Day Introductory regional training classes but could use some help getting started. Designed to get you up and going with e4Clicks Project Estimator or RSMeans JOCWorks, this course will give you the confidence to start knocking out some estimates. See below for our February trainings. Visit our website for a complete list of training offerings at www.4Clicks.com/training. We offer the perfect mix of virtual, regional, and onsite locations for our classes. Join us for one of our upcoming trainings; look forward to seeing you! ABOUT 4CLICKS: We are the premier provider of cost estimating and efficient project delivery management software and services. Our tools are By Estimators for Estimators. We help Owners, Contractors, Subcontractors, and AE’s increase productivity through the use of collaborative, transparent, accurate, and proven processes as well as robust cost information. The follow are excerpts from a RSMeans White Paper. An innovative method of contract management is being used more and more by owners who desire quick service and reasonable cost. Job order contracting found its genesis in the complex facilities world of the United States military. Tasked with maintaining and repairing thousands of buildings nationally and internationally, military facilities managers found the normal route of federal acquisition regulations much too slow and bureaucratic. Out of the need to solve this problem was born the idea of having an agreed-upon database of construction costs for both owner and contractor. This database would be referenced for estimating, negotiating, project control and closeout. Job order contracts, also known as Simplified Acquisition of Base Engineering Requirements (SABER), are types of Indefinite Delivery Indefinite Quantity (IDIQ) contracts used in the United States and internationally since 1985. 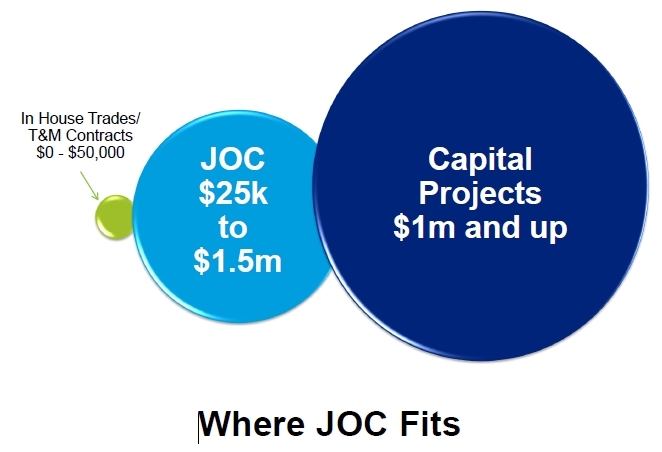 Billions of dollars worth of construction have been completed under JOC contracts since that time. The primary concern in JOC contracts is time. Federal acquisition regulations require a lengthy process of design, bidding and award for all contracts above a certain dollar amount. If, for example, a roof were leaking, the process of having it replaced could take anywhere from six to nine months. By using a JOC contract, the amount of time could be reduced to as little as six to nine weeks. The use of this type of contract has been authorized by the Federal Acquisition Streamlining Act (FASA)1 for just this reason. Secondary to time is price and quality. Goals for JOC contracts are increasing the quality level of work performed, as well as keeping costs down. Secondary goal attainment is enhanced due to the nature of the contract. The contractor is motivated to perform quality work at a reasonable cost by the promise of continued work orders and potential extension of the contract to option years. Independent studies have shown that the use of JOC will decrease the amount of time from job order identification to completion. The decrease in time is largely due to reduced design and procurement time. 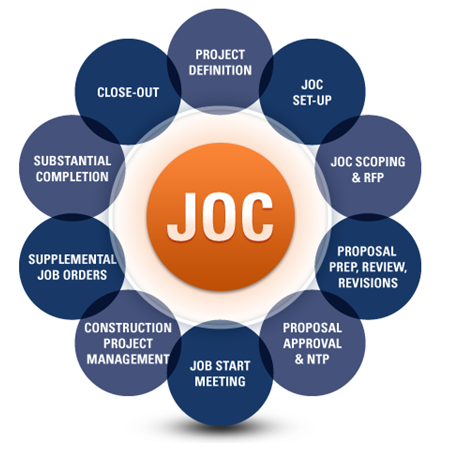 Most JOC job orders can be executed with streamlined design documents. This combination of limited design and decreased time has resulted in cost savings to the owner over traditional methods of contracting. The actual work performed in a JOC contract is often subcontracted, enhancing opportunities for minority and women-owned businesses and allowing some small companies to get their first opportunity to do government work. 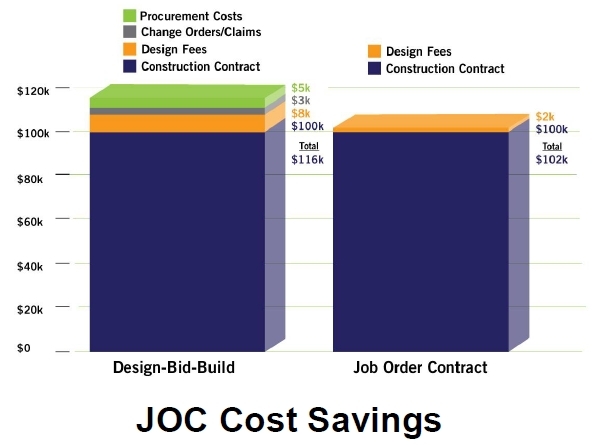 The primary disadvantage of Job Order Contracting is the learning curve for both owners and contractors implementing JOC for the first time. 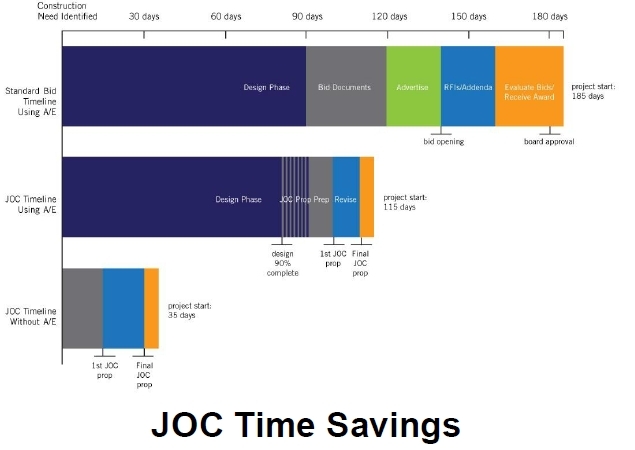 Learning the project development process and line item estimating methodology is a necessary investment for a successful JOC program, and appropriate training and support such as that provided by consultants like RSMeans is critical. Some owners can also encounter resistance from the contracting community when JOC is perceived as reducing the quantity of contract opportunities. This challenge can be addressed through appropriate contractor outreach and education and through the careful structuring of a JOC program to maximize opportunities for small and disadvantaged businesses, whether as prime or subcontractors.